Rome November 11, 2018 – The XLV Assembly of the Christian Evangelical Baptist Union in Italy (UCEBI) was held from 1 to 4 November, in Montesilvano (Pescara), preceded, on October 31, by the meeting of the Federation Evangelical Youth in Italy (FGEI). About 150 people, including pastors, delegates of the Baptist churches, and observers of sister churches, attended the opening cult with the preaching of Pastor Giovanni Arcidiacono, president of the UCEBI Executive Committee. Starting from the biblical reference that guided the Assembly works, “My grace is sufficient for you, for my power is made perfect in weakness” (2 Corinthians 12, 9), pastor Arcidiacono offered various points of reflection on the theme of God’s grace which is, he said, “the gift that contains all the others”. After the establishment of the Assembly seat – with Anna Maffei as president and Paola Zambon as vice president – new churches have been admitted as effective members of UCEBI. The afternoon session of the works was opened by the speech of Dimitrina Oprenova, a pastor of the Baptist Church of Sofia and vice president of the Baptist World Alliance (BWA). Oprenova conveyed to the Assembly the greetings of the BWA and focused her talk on the difficult situation of intolerance and discrimination that is being experienced in Europe and especially in Bulgaria. Last October 11, the Bulgarian Parliament approved in the first vote a bill that would seriously harm the religious freedom of minority confessions. On the second day of the meeting, the Assembly unanimously accepted the document on the ‘end of life’, with the following formula. “The Assembly in thanking the Bioethics Commission of the Baptist, Methodist and Waldensian churches for the work carried out welcomes the document “It is the end, for me the beginning of life. Euthanasia and assisted suicide: a Protestant perspective”. The document represents a precious and authoritative tool offered to the churches for a fruitful reflection”. In the following days, the delegates discussed and voted on the programmatic motion that gives the working address to the Executive Committee (EC) and indicates the fields and themes to be dealt with until the next Assembly of 2020. The delegates also talked about the Baptist identity in front of the current challenges and the political situation in Italy, reaffirming the commitment to non-violence, human rights and migrants and refugees reception. The delegates spent a long time on the theme of training, emphasizing the importance of adequate pastor qualification, assigning the EC to expand the offer in this field. In this context, it was also decided to start a project for the establishment of a study center named after Martin Luther King as a tool for testimony and the spreading of King’s figure, the relevance of his preaching to the present day and the struggles for civil rights. Among the mandates given to the EC there is also the possibility of organizing a joint Assizes, within 2020, with the Waldensian Board and the Standing Committee of the Methodist Churches’ Work Organization (OPCEMI), in order to strengthen common themes. 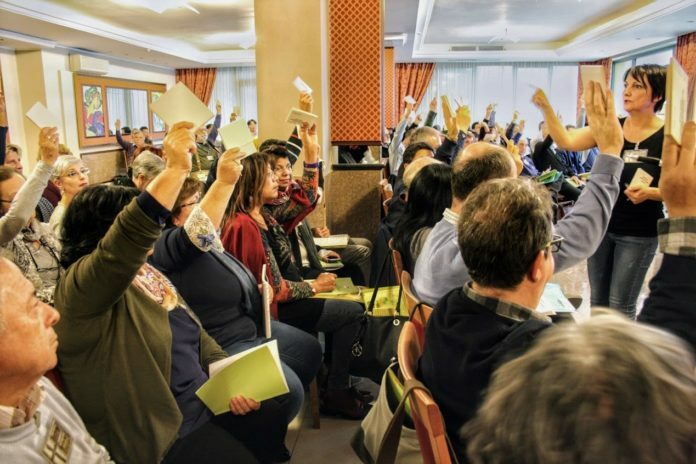 The motions on the Welcome Manifesto of the Federation of Protestant Churches in Italy (FCEI), and the Document on Ecumenism, elaborated by the Advisory Commission for Ecumenical Relations made up of Baptists, Methodists and Waldensian, were unanimously accepted.